Venus Williams during her 6-4, 7-6 (3) victory over Anastasia Pavlyuchenkova on Tuesday. 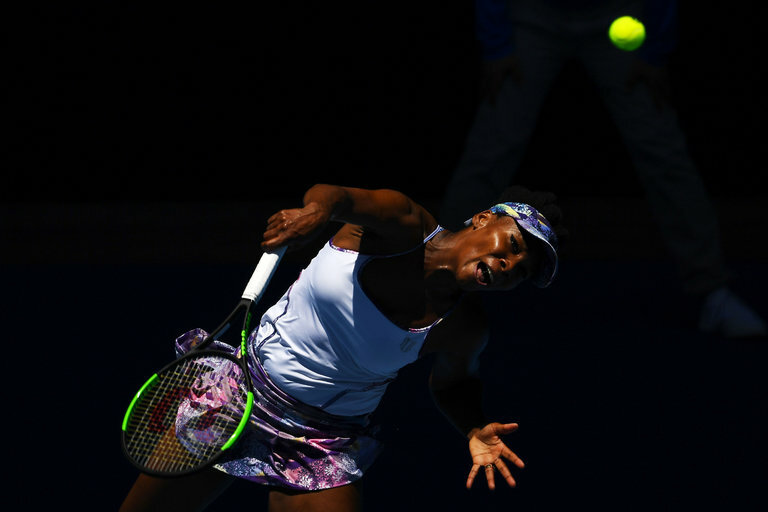 MELBOURNE, Australia — Venus Williams provided further proof on Tuesday that this is a throwback Australian Open, reaching her first semifinal here in Melbourne since 2003. Williams, 36, defeated the 24th-seeded Anastasia Pavlyuchenkova, 6-4, 7-6 (3), in a big-hitting quarterfinal in the sunshine in Rod Laver Arena. Williams became the oldest woman to reach the Australian Open semifinals in singles in the Open era, which began in 1968. She is the oldest woman to reach this stage of a Grand Slam tournament in singles since Martina Navratilova reached the final at Wimbledon in 1994 at 37. But to go further, Williams will need to defeat a member of the new wave: the unseeded 25-year-old American CoCo Vandeweghe, who swept past No. 7 seed Garbiñe Muguruza, 6-4, 6-0, to reach her first major singles semifinal in Tuesday’s second quarterfinal. The N.B.A. Dunk Contest Has the History. The 3-Point Contest Has the Stars.